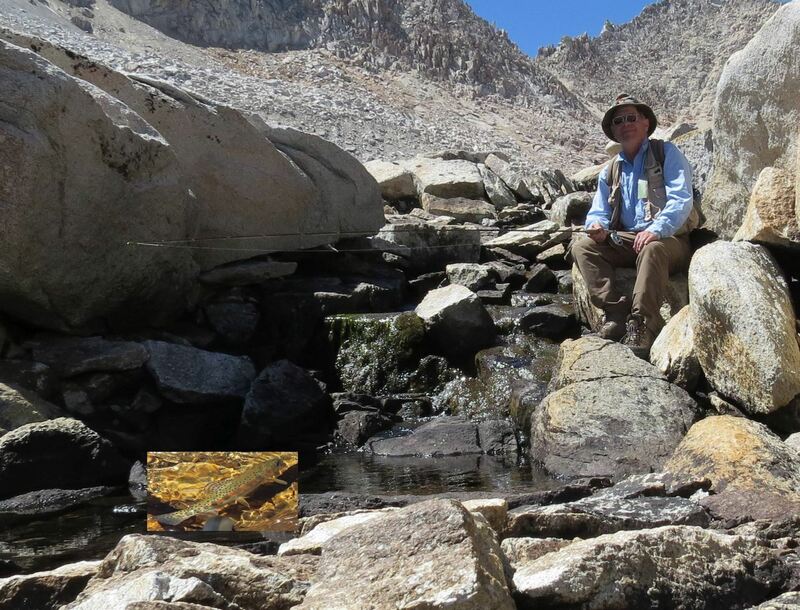 Peninsula Fly Fishers - Backpacking for California Gold: The Higher the Fewer. Backpacking for California Gold: The Higher the Fewer. Cost: Outrageous fish stories and share in the gas. Requirement: Physically fit to walk up to 11,700 with a backpack. 23-June. The plan is to leave the Bay at noon on 23-June. Drive to Groveland for dinner and stay overnight at the Sawmill walk in campground East of Yosemite at 9800ft. 24-June. Up early to have breakfast in Bishop and pick up the reserved permit at 8:00am from the ranger station. Then park at the trail head and start the arduous climb on trail to 11,700ft. This will take one and a half days. The first night the group will stop at the shore of a lake on the way up. After the second day it will be cross country above timberline. So people who choose to go should be experienced mountain hikers who know their physical limits. 25, 26 June fish at 11,700ft for Golden_Trout. 27-June hike out to the car and drive back to the bay area. There is always enough camping equipment and food arrangements that can be made available to accommodate almost anyone. Details will be available for those who want to sign up. The key requirement is to be in physically good shape for the hike up to and down from the lakes. Also, staying warm, dry and injury free regardless of the weather. Help fishing and rigging rods for lakes available will be gladly provided. In addition to fishing, exploring the magnificent views, multiple lakes, and water features round out the activities. In the end a poll will be taken to see who has learned the source of the title for this trip.